Good, simple, effective explanation and images. We have to keep reminding ourselves of how MMP works, each election many people questioned about their understanding of it are uncertain. There are the wealthy retired who can make overthrowing the democratic system a hobby for their old age, a challenge to mount a campaign about. This is after a lot of personal input by activists and bodies educating and explaining MMP. Those people don’t have the advantage of the cruisy lifestyles of the FPP advocates, but active support for MMP must continue to prevent sliding back by many people who still cling to FPP because they’re used to it. They have difficulty imagining anything else especially one that requires changes such as having list members. Then, I hope everyone is supporting, financially or otherwise, Dr Sandra Grey’s campaign to get the word out about MMP. Admittedly not nearly as mutually exclusive as with FPP, but still… List MPs “representative”? Of whom? People who get high paid positions due to affirmative action and then do nothing? And MMP entrenches two party rule as solidly as does FPP… it’s just that third parties get a better chance but not an equal chance, because strategic voting, including the spoiler effect, is still a factor in people’s minds. And parties continue to matter much too much. Keep proportionality, ditch MMP I tells ya!! Yes we definitely need more small parties and independents in Parliament. And larger parties who aren’t afraid of having MPs on a longer leash. Read your reasoning before – the video refutes that as well. Representative democracy will always result in a party based political system the same way that FPP will always result in a two horse (party) race. I don’t think it does. Why, for instance, would 120 MPs, every one linked back to an electorate under a multi-member STV system, want to bother with parties? Assume, for the sake of argument, parties were disestablished to create a “clean slate”. They would have the freedom to follow their conscience on every issue (and the will of the people who elected them). Issues would be truly debated, not subject to set piece rubber stamping exercises. And they could go back to their electorates and be viewed with respect – because I, and I think most people, will respect someone with whom we disagree if their position comes from principle, not what the Leader’s office told them to think. Why would someone keen to make a difference as an MP yoke thenselves to a party? Parties are vehicles to get elected, and are very effective at that. They stand in the way, however, of good governance. Allow people to get elected eithout them, and why would they seek a return? You’ve read history? Party systems arise every time as a consequence of trying the individual MP voting their conscience that you are describing. They arise in the forum. Parties as election vehicles are late developments. Because there will be multiple people with similar views all trying to get elected. If they work together they will be stronger than if they work independently and, if they get enough of their people voted in, they will be able to use that power to make changes that they want. The changes may not go as far as they want but they will have influence where they wouldn’t if they hadn’t been voted in at all. A friend of mine once asked Muldoon about a Parliament with all independent MPs. He smiled his crazy old smile and said it would never happen. Too much power would be lost. Pyramid building is still the great hope of the rich and the powerful. Representative democracy is an oxymoron. In the same way as the term anecdotal evidence. 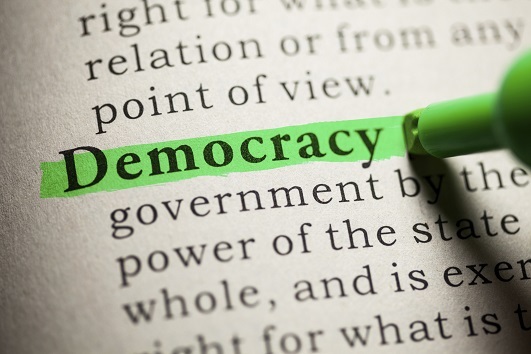 Democracy is rule by the people, not, by a revolving door of self appointed incompetents the names of whom we are graciously allowed to change every three years. Of course democracy is something that will only happen over the bodies of our present establishment. Both the left and the right want do not want any restrictions on forcing their particular brand of compulsion on us whenever they get the treasury benches. We have had decades of government where individual pieces of legislation are largely opposed by the majority and the only way to oppose it is to vote for the lot we did not like last time. I’d much prefer direct democracy myself, KJT. Did what I could back in ’99 to convince parties and the electoral authorities to trial electronic voting. Was doing okay, too, till I foolishly opened my trap and pointed out that if we could achieve secure electronic voting we could hold as many referenda as we liked… no need to impose virtually impossible signature levels as triggers “because of the expense”. Suddenly all the parties went cold on it. As No right turn said, “even if they are the wrong decisions, they are our decisions to make”. It must take a particular arrogance to think have the right to individually make decisions on the lives of 4 million people. Especially with the notable lack of general knowledge and competence of most politicians. I sometimes wonder if Tame Iti is right. I can’t believe my ears (or eyes) when people sitting on their arses commenting on blogs write about how politicians are ‘incompetent’ and have a ‘lack of general knowledge’. Utter rubbish. This is such a teenaged attitude, based purely on the fact that some political decisions you’ve witnessed seem to be unaligned with your own personal political opinion (or at least, you think they are, but you actually have no clue because you yourself are just an armchair critic, NOT a political analyst, an economist etc. so you have NFI what is actually going on). Many politicians have reached the apex of successful careers in academia, the justice system or even business management, and know far more about the experience of being an active citizen than you do. The media has a field day reporting their weakest moments (and good on them, thoroughly within their responsibility to do so), but don’t let this lead you to believe that you have a gaggle of incompetents dictating your policy. All government bills are built on a foundation of expert knowledge and research, whether politically aligned or not, and indeed exposure to this expert input is unavoidable in select committee stage. So while you sit there eating porridge and whinging about how MPs don’t have any general knowledge, remember the fact that they’re actually busy all day running your goshdarned country. You always shout about democracy, having rule by the common person, yet when you are faced with real people in power who are capable of making real mistakes, you’re horrified. No authority is safe from the harsh scrutiny of apathetic morons. You do not know what my qualifications are. People who are really successful in academia or business do not generally enter politics. Key has been placed as a figurehead to advance an agenda of burgling NZ. It takes a form of arrogance and ignorance, that most competent people do not have, to think you have a right along with 120 other incompetents to dictate the lives of 4 million people. And make no mistake. Most of the things politicians do or say take your breath away with the lack of sense. National standards being just the latest thing in a long list. You do not tell surgeons to take out the intestine for an appendectomy. Not to mention asset sales, tax cuts and slavishly following the UK and USA down the gurgler against all the evidence. Just to mention a very few of the cockups i’ve seen over the last 40 years. If they have expert knowledge and research to draw on why don’t they listen to it. Watch the ball sup in Christchurch. Japan and Australia had portable accomadation heading for the area the day after. NACT at the moment are either incompetent or criminal. In my job there is strict liability if you get things wrong. Pity it does not apply to parliament. Douglas and Key would be in jail. Democracy does not mean a dictatorship we are graciously allowed to rotate every three years. Please give me your thoughts on the TPPA. Rex – you are describing the situation in Ireland. It is okay but the problem with it is that governments often have to rely on independents who, by necessity and inclination, are extremely parochial in outlook and in their demands. This can often result in decisions that are not to the benefit of the country as a whole, but just a single constituency. So the complaints that people make about MMP are even more exaggerated under multi-member STV. Also if the rules governing political parties forced them into open direct elections for their list candidates you may get more people joining the parties and more democracy. Yep, but that’s because not every MP is an independent. If they were it might still happen… a grouping agreed on a particular issue might need one more to make up a majority and that one more might try to extract some pork… but if they coalesced differently round different issues, eventually everyone would get a piece of the pork… if that makes sense. Absolutely! The biggest drawback of MMP disappears overnight. Perfect. But no serried ranks of compliant and docile List MPs asking “what is thy bidding, Master?” of the party leadership? Not gonna happen, damnit. But if we’re lumbered with MMP after the next referendum and you want to run that idea via some sort of lobby group, I’m in. Yep. I always thought one of the biggest improvements to MMP would be if voters could order the party lists. The people that for them. They don’t gt an equal outcome because not as many people vote for them. Strategic votes are still votes. And this is the crunch of it. Parties exist. In all systems, parties form. They exist because the people want them. The nut of it is that people disagree with each other. There is no mp, or potential mp, that can represent anyone but herself. All representatives are compromises for the voter. So, voters make alliances with each other. Not mps, voters. They compromise with each other to vote for a platform, and they want that compromise platform enacted. To get that done, politicians form parties and promise to hang together. To get things through a parliament requires these alliances between politicians. To get votes, those alliances need to present a platform that voters will agree to. Ergo, disciplined parties. Systems that do not have parties built in, will have parties emerge anyway. So build ’em in I reckon. It’s more honest. Lots of things exist. And re-form even when you take pains to destory them. Cancer. Peter Dunne’s hair. Continued existence is no evidence of desire. I agree the sortsd of people drawn to politics want them, as they provide a way for the otherwise unelectable to get into Parliament. All they need offer in return is their integrity. But everyone else? Not so sure about that, Pb. Try asking a random sample in your neighbourhood if they’d like an independent MP. I’ll bet a fair number would, but would never cast their vote for one lest it be “wasted”. I voted in my first ever election in the first ever MMP election. I remember walking to the school behind my house, being pretty proud, splitting my vote because I already understood tactical voting (I also remembr having to explain it to my parents who had voted in countless elections), and then watching the elections that night. My candidate didn’t win but I wasn’t too shook up as I knew my vote was being counted for the party I truly wanted (It was the Alliance Party at the time as they housed the Greens). Every three years since then, I have always been hopeful in every election because while my party was never going to “win”, I would be represented in Parliament. Well, that has all changed. I am currently resident in the UK and last year voted in my first ever FPP election and no experiance has ever left me feeling so alienated from politics. Commenting on Proportional representation, David Cameron stated “The principle underlying all the political reforms a Conservative government would make is the progressive principle of redistributing power and control from the powerful to the powerless. PR would actually move us in the opposite direction”. Really David, because I tell you, nothing has ever left me feeling as powerless as an FPP election. Once again I am left at the mercy of the “tyranny of the majority” and have literally had my vote discarded as meaningless. FPP reinforces some archaic notion of the country being split up into villages that need representation solely on that level. This may have been true in Ye Olde Times when communication was scant, and the idea of a real Country was new, But we are centuries beyond that point now. I do not understant why my vote for the Green Party in the UK should be discounted because I don’t choose to live in Brighton, home of the UK’s sole Green MP. FPP is fine, only for those who support either of the major parties. There is a reason they do not support electoral reform, and that is because they know that if Parliament truly represented the wants of the people, it would well and truly bite into their support. Sorry this is a bit disjointed but I am writing it at work. needless to say, going back to FPP would be a MASSIVE leap backwards and would disenfranchise around a third of voters (and do not kid yourselves, there are people who are still voting tactically for the major parties when they would rather support a minor party they thought might win). You made perfect sense to me, and it’s true. National voters always vote for National, because National always has the same agenda, and they want the money and power to be exclusive to them, i.e. an unequal society, which never changes and everyone is kept in their proper place. We can assume Key will use the same propaganda as Cameron has to try to destroy support for MMP.